Nan Roman, President and CEO of the National Alliance to End Homelessness, is a leading national voice on the issue of homelessness. The Alliance is a public education, advocacy and capacity-building organization with over 10,000 nonprofit and public sector agencies and corporate partners around the country. Under her leadership, the Alliance has developed a pragmatic plan to end homelessness. 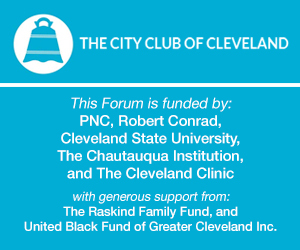 During her address to the City Club of Cleveland, Ms. Roman discussed the national movement to end chronic homelessness, the successful strategies communities are employing around the country, and the progress that has been made toward this goal. Ms. Roman also discussed the work of the National Alliance to End Homelessness and what she believes it will take at the federal, state and local level to finally end the expensive tragedy of long-term homelessness.